The NodeMCU ESP32 board (in some cases also known as ESP32-DevkitC) is fully supported by ESPHome. 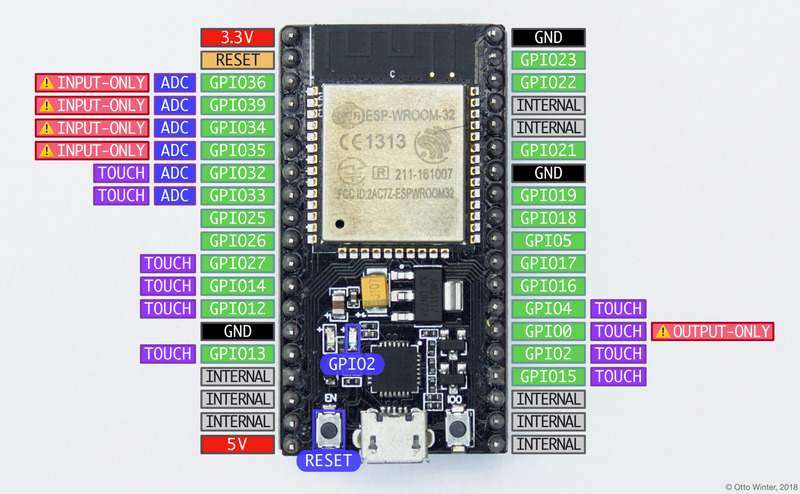 Simply select ESP32 when the ESPHome wizard asks you for your platform and nodemcu-32s as the board type. The ESP32 boards often use the internal GPIO pin numbering on the board, this means that you don’t have to worry about other kinds of pin numberings, yay! Pins on the NodeMCU ESP32 development board. Note that in certain conditions you can use the pins marked as INTERNAL in above image. GPIO0 is used to determine the boot mode on startup. It should therefore not be pulled LOW on startup to avoid booting into flash mode. You can, however, still use this as an output pin. GPIO32-GPIO39: These pins can be used with the Analog To Digital Sensor to measure voltages. GPIO2: This pin is connected to the blue LED on the board as seen in above picture. It also supports the touch pad binary sensor like some other pins. 5V is connected to the 5V rail from the USB bus and can be used to power the board. Note that the UART chip is directly connected to this rail and you therefore cannot supply other voltages into this pin.